Way back when, several Americans wrote about their experiences as POWs in the Vietnam War. The books by Robinson Risner and John Dramesi made a great impact on me because they graphically detailed the physical pain and deprivation suffered by Americans held prisoner by the North Vietnamese. 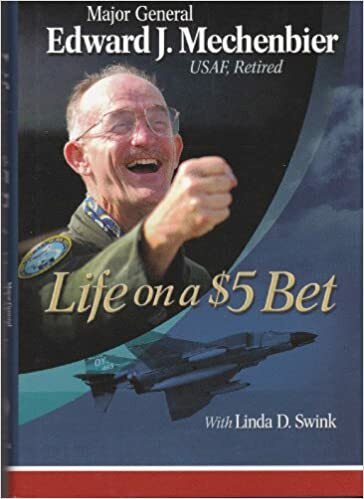 In Life on a $5 Bet (Little Miami, 323 pp., $30), Edward J. Mechenbier, with the help of Linda D. Swink, has written an account of his time as a POW in Vietnam, but from a different perspective. His recollections focus on the psychological interplay between prisoners and their guards. Although Mechenbier cited the Code of Conduct as a guide to proper behavior for a POW, the Code’s overly restrictive rules caused more hurt than help. The “die-before-you-talk” restrictions of the Code trapped men in untenable positions. Mechenbier admits as much. He mentions the Code a dozen times in a positive way, but he does not discuss the post-war controversy that caused its revision. Mechenbier names a lot of names, none more than Kevin McManus, his F-4 backseater and Air Force Academy classmate who was shot down with him in 1967. Frequently together, they made the rounds of the Hanoi Hilton, Plantation, Zoo, Camp Faith, Camp Unity, and Dogpatch prisons for five years, eight months, and four days. After repatriation, Mechenbier returned to duty as a fighter-branch test pilot because flying was all he wanted to do. He resigned his commission, however, when regulations required him to move to a non-flying job after eleven years. By then, his wife and he had adopted three daughters—from Vietnam, Thailand, and Korea—and then conceived a son of their own. After resigning from active duty, Mechenbier joined the Ohio National Guard to fly the F-100. He soon took command of an A-7 squadron, leading it for seven years. Recognizing greater opportunities for advancement, he transferred to the Air Force Reserve, giving up flying. He excelled as a high-level jack-of-all-trades and eventually attained the rank of major general. A specially designed program for generals allowed him to return to the cockpit of the C-141. While performing his National Guard and Reserve duties, Mechenbier held several full-time jobs as a civilian in the flying industry, about which he tells many interesting stories. His final official Air Force flight was piloting a C-141–known as “the Hanoi Taxi” because it was the plane that had brought him and the other POWs home from Vietnam in 1973—on a mission to Hanoi to repatriate the remains of two American MIAs in 2004, a fitting finish to forty-four years of military service. 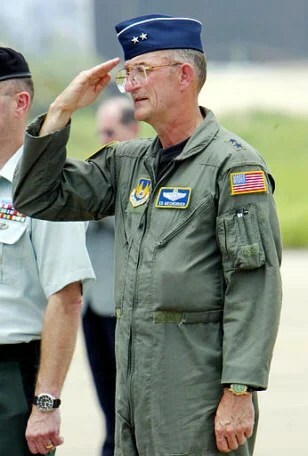 In the photo above, he is saluting the remains on the tarmac in Hanoi. The title, by the way, is based on a bet between Mechenbier and his father regarding an appointment to the Air Force Academy. This entry was posted in Memoir, Nonfiction, POW/MIA, Vietnam War and tagged Edward J. Mechenbier, Edward Mechenbier, Life on a $5 Bet, Linda Swink, Vietnam War memoir, Vietnam War POWs by vvaposted. Bookmark the permalink.